"Healer" redirects here. For information about the item in Super Smash Bros. Brawl and Super Smash Bros. for Nintendo 3DS / Wii U, see Team Healer. The Healslime as it appears in Fortune Street. 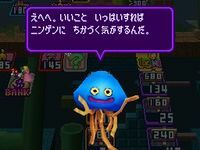 Healslime's appearance in Itadaki Street DS. Healslime, often known as Healer, is a support/guest character in Itadaki Street DS. Players are able to summon it for extra help after they have obtained its card. 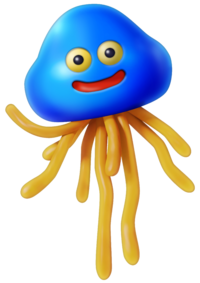 Healslimes are some of the many different Slime species in the Dragon Quest series, resembling jellyfish. As their name implies, their main skill is healing their fellow monster teammates in battle using magic. In Fortune Street, Healslimes give free suits when the player passes by them or if the player lands in the same square that has them. The player gets to choose what suit they want or if the player has all of their suits, he will give them a Suit Yourself card. Healslimes appear the same way as in Itadaki Street. The Healslime in this game is named Healie, a reference to a character from Dragon Quest IV who assists Ragnar, one of the game's party members. This page was last edited on March 20, 2019, at 04:11.